Staff were very friendly, convenient parking and the rooms OMG they were DEVINE !!!!! Clean and luxurious. A great location. For a serviced apartment only one large cooking pot. Difficult to cook eggs and so on. Air con seemed not to work. In Melbourne can be a probem with the cold weather. We loved our stay at Quest. Our apartment was very clean and had everything we needed for our mini break. Perfect location for families as you can walk to so many places, our boys loved it. Would highly recommend. I was here for a short stay to attend a conference. The staff were helpful when there was a problem with my credit card, and helped me find an alternative method. The location was great for getting to the Arts Centre and the room was lovely. Searching for a fabulous place to stay in Melbourne, the capital of Victoria? Whether you're on a cheap wine or champagne budget, you'll find a great hotel in Southbank, 1 kilometre from the centre. Sure, you could spend your long-awaited break doing nothing but kicking back with your feet up and a drink in hand, but you'd be really missing out. Melbourne boasts a range of unmissable sights, like the Crown Casino and Entertainment Complex, Federation Square and St. Kilda Beach. You've gotta see them! The Melbourne Museum and the National Gallery of Victoria are in the area around Southbank. These top tourist sights need to be on your travel list. Too exhausted to travel for miles? 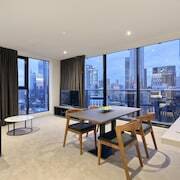 Want to find a lodging near the Crown Casino and Entertainment Complex? Easy. 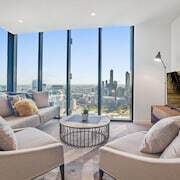 Try the AKOM Docklands, Crown Towers, Park Hyatt Melbourne, Grand Hyatt Melbourne and Docklands Private Collection of Apartments - NewQuay. You won't have to drive for ages to experience the Melbourne Museum. 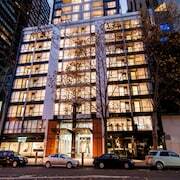 Wake up nearby at the Clarion Suites Gateway, Crown Metropol, Mantra Southbank Melbourne, Melbourne Short Stay Apartments MP Deluxe and Tribeca Serviced Apartments Melbourne and have more time for the fun stuff. The fantastic calendar of entertainment and events at Margaret Court Arena is a drawcard for many tourists. You'll find a few places to crash close by. The Caroline Serviced Apartments South Yarra and Art Series - The Cullen are fabulous spots to rest your tired noggin. Check out the schedule at Sidney Myer Music Bowl for any upcoming concerts. Do you need somewhere to rest your head around here? 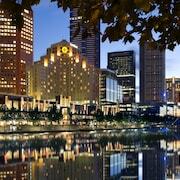 The Quest Grand Hotel Melbourne and Pullman Melbourne on the Park are popular with many visitors. The more money you save on accommodation, the more you'll have to spend on Southbank experiences! The Urban Central Accommodation - Hostel is one of the only budget hotels here, so there's no time to waste. You definitely don't need soft bathrobes, a mouth-watering room service menu and Egyptian cotton sheets all the time (that said, you are on holiday, right?). 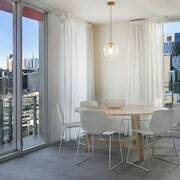 The more elegant options here include the Southbank Apartments - 28 Southgate and Travelodge Hotel Melbourne Southbank. Holidaying with your BFFs but need a bit of 'me time'? Fancy just chilling with your phone and a hot cuppa? Then why not find a secluded corner in House of Cards? Trust us, you'll need something substantial to pig out on after all that sightseeing. Luckily, Sealife has a tasty menu which will really fill you up! Now you've warmed up, we don't reckon you'd say no to a few bevvies at Depa Chingon. It's an excellent place to debrief after a day of adventures. Don't pull your hair out if you can't secure the ideal Southbank hotel. You'll find other places to crash out nearby. Southbank Promenade is 0.5 kilometres from Southbank, and South Melbourne is 0.7 kilometres away. So, have a quick peek at the Southbank weather report, pack your favourite outfits and get a wriggle on! You're only a few clicks away from awesome nights and breathtaking adventures!